Superman is flung into orbit but a colossal stone hand stops him from flying into deep space. The Oracle has arrived but appears a lifeless stone statue to Clark as he flies up to the face of his rescuer. The strange visitor beams images of the past, present and future directly to Superman. From the visions, Clark sees that H'el will ultimately succeed despite their efforts though when he tries questioning the Oracle all that the Oracle does is fade away to nothingness. Superman dashes back to Earth and radios in to the Justice League satellite for a report on the rest of the heroes. Batman and Cyborg monitor earthquakes, tsunamis and time warps while Flash does his best to combat them on Earth. Cyborg asks Superman to find a way to stop H'el fast and Superman increases his speed knowing how desperate their situation has become. Back in the Arctic it seems Supergirl has finally woken up to her mistakes. H'el tries to reach out to her in the name of 'love' but Supergirl refuses to budge. In the meantime Wonder Woman continues to provide a distraction while Superboy uses his full TK power to collapse the Star Chamber. Kon-El's concentrated power rips the majority of the Star Chamber apart in an explosion of smoke and shrapnel. Wonder Woman asks H'el what the consequences of his actions will be and the misguided Kryptonian admits to what they suspected... that Earth, along with the entire solar system will collapse. Just before H'el attacks the three heroes Superman rams into his 'brother' pointing out if H'el had come to him with his idea then Superman and the others would have volunteered to help him albeit not at the cost of an entire solar system. The force of Superman's blow is so powerful Dr. Veritas can hear it at the Earth's core and even Cyborg and Batman are astounded at the power levels in the JL base. Suddenly H'el's ship rises from the debris of the Star Chamber. At this point, Superboy, Superman and Wonder Woman all realize that the ship was actually inside the chamber being supercharged, the external shell being destroyed by Superboy was all part of the plan. H'el smiles that while Superman had spent his life hiding as a human, he had been plotting for this exact moment and now H'el has duped them all. Superman is knocked back by a powerful blow as H'el teleports to the entrance of his ship. The villain points out that his plan was always to help save the people of Krypton, help rescue the greatest minds of the universe at the cost of a tiny planet. As H'el is about to climb onto the ship Supergirl calls out to him. She pleas with him that she has seen his way is right and she should go back with him. H'el smiles that his young companion has decided to rejoin him and agrees to allow her safe passage. Superman cries out begging Kara not to go but H'el traps the three defiant heroes in a telekinetic trap. Supergirl weakly rises to embrace H'el. As he explains that he did what he did for the love of Krypton and also for... (her) but Superboy notices that Kara is turning green from poisoning. Realizing what Kara is planning Superman begs her to reconsider, while Diana points out that Supergirl is doing what she must for the good of everyone. H'el realizes too late that Kara is sick from poisoning and tells her he really does lover her and that he would do anything to help her but while he is distracted by concern Supergirl plunges the Kryptonite deep in to H'el's chest. Supergirl reveals she realized he was opening the time portals psionically, with his power focussed on keeping the portals open he had to trick Superboy into using his power to aid him by releasing his ship. The only thing keeping the portals open was H'el's sheer willpower and without him the portals would shut and the solar system would be safe once more. H'el offers forgiveness for Kara foiling his plans and though she is saddened to leave Krypton behind she coldly tells H'el his forgiving her means nothing. The bonds that held Kon, Kal and Diana dissipates and Superman races to Kara. A wounded H'el opens one last portal and fades away. Superman thanks his cousin for saving them all, but watches as she begins to fade from the Kryptonite poisoning, racing to the Fortress Superman hopes his medical center facilities can save his cousin's life. 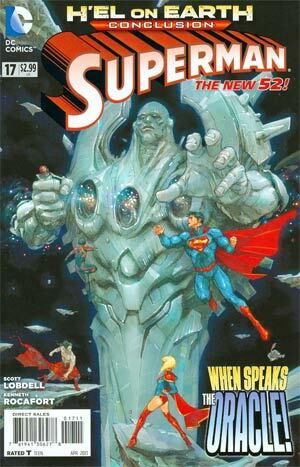 The Oracle, watching from space, realizes that Superman and his friends have saved the omniverse this day but also have set a chain reaction for Superman's future that may lead to the Oracle's predictions once more. 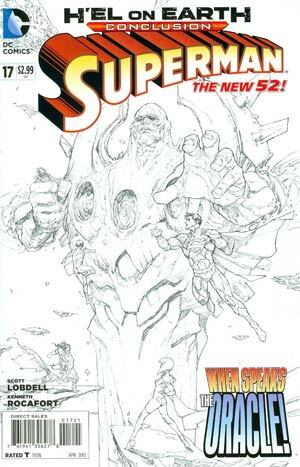 Twelve years prior to Superman #0 and the death of Krypton a young student wanders away from a scientific dig. The class professor enquires who the missing student is and realizes it to be his star pupil, Jor-El. Story - 4: I'll admit I was blown away by the epilogue. I knew from Superman #0 that Kal, Kon and Kara would be traveling back to Krypton somehow but the ending was a pretty cool twist I hadn't seen coming. The H'el arc has been 'hit and miss' and the Star Chamber dupe was a plot device I thought was unnecessary. Kara has redeemed herself, finally embracing her living family and saving the Earth after months of being manipulated. Superboy finally became a hero rather than a petulant child. There is a lot to be thankful for from the arc, it has set a few things right with the characters, whether this all sticks now that the epilogue has been revealed is something I now look forward to. I am very disappointed that H'el's bizarre power set hasn't been fully explored or revealed, though I now look forward to his return as opposed to how I originally felt towards him initially. Oracle turned out to be a turkey and that is a massive disappointed, after his massive lead in from all the way back to Superman #1 it was such a bland and pointless part of the story. I had hoped he would be more than just DC's version of Marvel's Watcher. All this and the JL was battling the effects that was destroying the rest of the DCU, it might have been nice to see some of that epic disaster damage than just a throwaway line here and there. If it wasn't for that let down I would have awarded the issue a solid 5. Art - 5: The frenetic script and solid action scenes really suited the art. I think Rocafort excels when he does sequences that focus on a fast pace. I hope he stays on the title for a while longer. Cover Art - 2: Firstly, the scene doesn't happen. Dr. Veritas was never present on a physical level. Secondly, the character proportions are off, either on a perspective basis or physically, I'm just not sure. Thirdly, I think misleading the reader into believing Oracle was the 'big bad' was such a lost opportunity to really allow H'el to take center stage. Just a personal preference though.